If you ever discover Crybrazil Ransomware up and running on your operating system, be sure to do everything in your power to delete it once and for all. It is critical to terminate it since it exhibits incredibly malicious inner workings. Like any other ransomware application of this classification, it is primarily designed to encrypt data on the affected hard drive without any notification or authorization. It should be self-evident that having a piece of software up and running on your computer, could have disastrous outcomes, to put it lightly. To have a better understanding of this malicious programs inner workings read our report in its entirety. In addition to such information, you will find virtual security tips that will help you maintain a clean and safe operating system. Finally, we include a detailed removal guide, which you should use to delete Crybrazil Ransomware without encountering any major problems. During the extensive analysis of Crybrazil Ransomware, our malware experts noticed that it is created using the Hidden-Tear project, which is a favorite among malware developers. Other malicious applications crafted with the help of this project are Assembly Ransomware, French Ransomware, and Foxy Ransomware. Thus, it is not at all surprising that all these devious programs function alike. Once the malware in question gains access to your operating system, it immediately starts doing its dirty work. Before it starts locking your data, this ransomware identifies the contents of your hard drive. It is essential to note that all the files affected by this intrusive program are encrypted with a robust cipher, which indicates that manual decryption is not a viable option to solve your problems. As it turns out, Crybrazil Ransomware mainly attacks %USERPROFILE% folder and its sub-folders. Because of that, most of your programs will cease to function because files necessary for their inner workings will be unusable. The ransom note informs you that your data is locked and will remain locked permanently if you do not pay a ransom. While that might seem like a way to get yourself out of the trouble that you are already in, it is crucial to note that cyber crooks responsible for this malware are not legally obliged to unlock your files even if you abide by their demands. To regain access to the affected data try using your shadow copies or backups of your hard drive. By now it should be more than obvious that you must delete Crybrazil Ransomware without any hesitation. Do so with the help of your detailed removal guide, which you can find below. 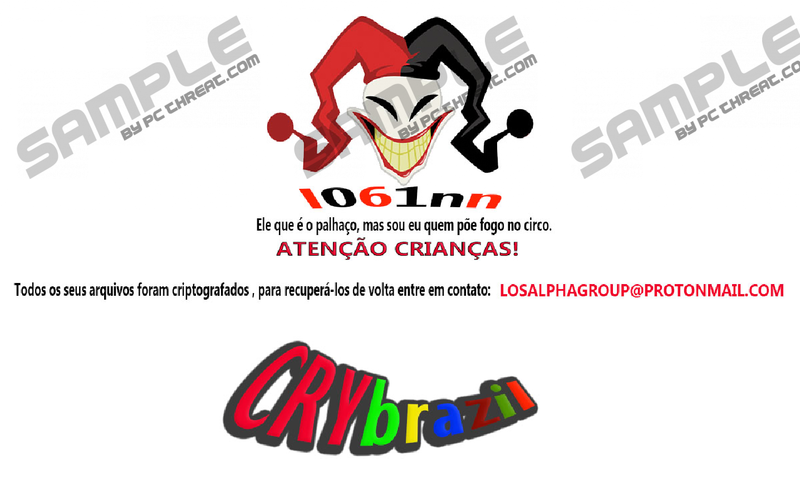 It is critical to note that Crybrazil Ransomware is primarily targeted at users located in Brazil; thus, if you happen to be a user located in Brazil, you should be extra aware of this application's existence. To improve your overall virtual security, you should take a few precautionary steps. Start by practicing safe browsing habits. Be sure to refrain from unauthorized download sites or email attachments that come your way from unknown third-parties. Doing so is vital since malware developers often spread their devious applications via spam email campaigns or devious distribution web pages. Furthermore, you should know cyber crooks tend to use hoax advertising tactics to trick naive Internet users into downloading their suspicious and malicious applications without knowing how they work. Therefore, we recommend learning as much as possible about each program that you want to have on your computer beforehand. Also, you should know that there is a possibility that a malicious program could enter your PC via an unprotected RDP (Remote Desktop Protocol) connection. Thus, if you use RDP connectivity, always make sure that it is set up in a way that it is secure at all times. Take these seemingly simple steps, and your virtual security will become virtually unbreakable. To delete Crybrazil Ransomware once and for all, follow the instructions that we present below. Under no circumstances delay the termination procedure since keeping this malware active on your computer could have disastrous outcomes. Also, you should double-check your entire operating system for anything associated with Crybrazil Ransomware as soon as you are done with the encryption procedure. Doing so is imperative because leftovers of this malware might act deviously. There is a chance that leftovers could trigger this malicious application's restoration. Also, they might prove to be enough for Crybrazil Ransomware to continue doing its dirty work. If you find analysis of your computer a bit too complicated be sure to scan your PC with a reliable antimalware tool because it can detect and delete anything associated with this ransomware automatically. Select a folder called Rand123 and tap Delete on your keyboard. Right-click Recycle Bin and then select the Empty Recycle Bin option. Quick & tested solution for Crybrazil Ransomware removal.